SHOULD I STREAM MY MUSIC ONLINE? This is the first in a series of blog posts covering topics related to music marketing. The slides in this post are from a presentation at the 2015 College Music Society Conference in Columbus, Mississippi. I was selected to present on this topic along with my fiancé, Jennifer Jones. Ms. Jones is a marketing expert and principle partner with Anderson Jones PR and Pinpoint Market Research. Our presentation covered the online music landscape, creative case studies, the social media landscape, the new “publish or perish” model and questions to ask yourself as you design your marketing campaign. This bog post will focus on the online music landscape, specifically, the pros and cons of online streaming. These numbers represent an average paid by each service, which can be more or less depending on how many streams you receive per month. For example, Spotify, used by more than 50 million people, takes 30% off the top and divides the remaining 70% of their $10 per month subscription between everyone involved in the recording. They do this by dividing your streams by the total number of streams on their service each month. 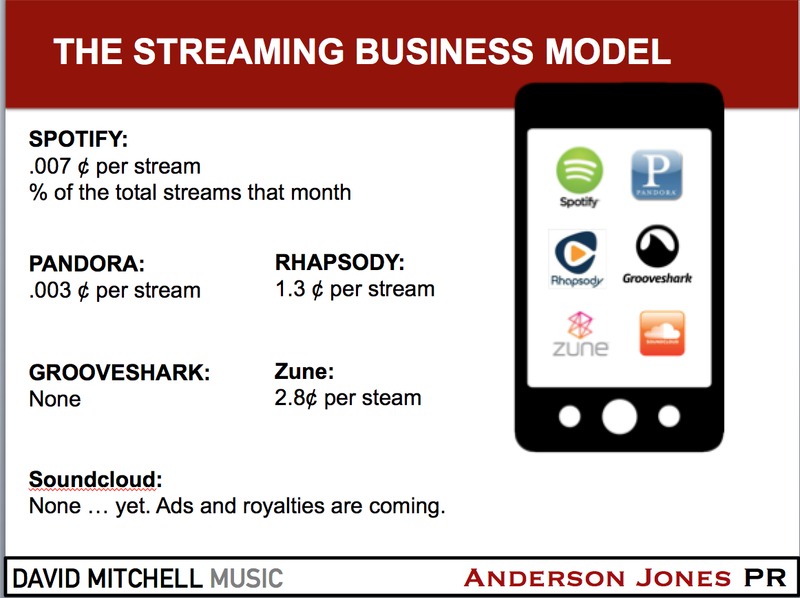 On average, this works out to be roughly .007 cents per stream. If your song streams 10,000 times you will receive $70 per month on average. This is divided among your band mates, the producer and your label, so you’ll receive enough to purchase a Happy Meal or two, which would be funny, if it wasn’t so sad. This is why even major artists like Taylor Swift have removed their music from Spotify. According to Time Magazine, her estimated pay out for “Shake It Off” was roughly $280,000 to $390,000. Her total streams for this song were 46.3 million. If we use the high number of $390,000 and divide that by 46.3 million, the average pay out per stream was .0084 cents per stream. Not good, especially if you consider she must divide it between everyone involved in the recording. By comparison, Michael Jackson sold an estimated 66 million copies of Thriller according to the New Yorker. Sources have estimated his income from this album was roughly $129 to $500 million. Admittedly, this was an album and not a single, but it does illustrate the fact that streaming pays a fraction of what record sales used to pay. The upside to streaming is engagement with your fans. Streaming does offer the average, independent artist the ability to reach 50 million potential fans on Spotify alone. 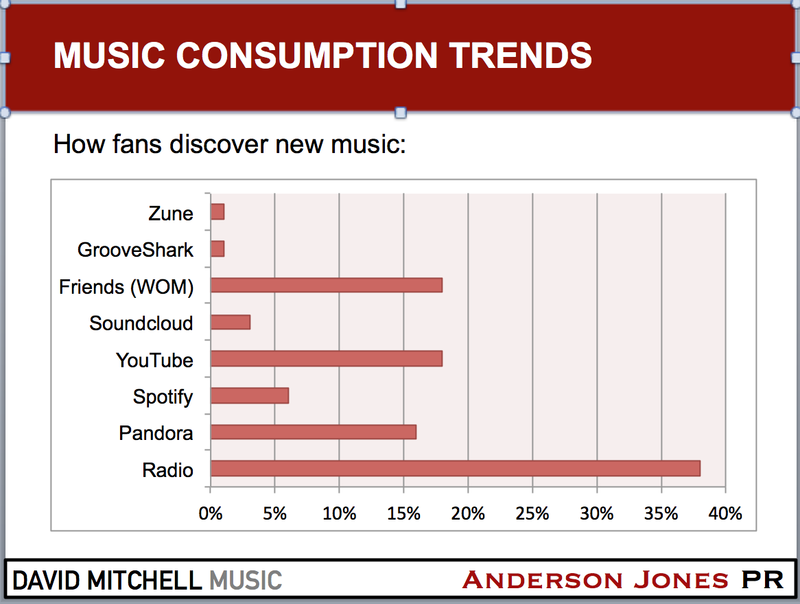 In a recent survey conducted by Pinpoint Market Research, 31% of millennials said they listen to music on streaming services and roughly 45% discover new music on streaming services like Pandora, Spotify, YouTube and Soundcloud (see the slide below). So, if your goal is to reach fans and drive engagement, streaming can help, but remember, you’re essentially giving away your music to get people to your shows and engage fans. Before you put your music on a streaming service, you should decide what your goals are. Do you want to profit from the recording itself or do you want to reach as many fans as possible and drive engagement? If profit is your goal, consider placing your music on streaming services that pay the most per stream, probably not Spotify, Pandora or YouTube. If Taylor Swift can’t make a significant profit on these services, you probably won’t either. In my opinion, musicians should never give away their music. It lowers the bar for everyone in the industry. Instead of racing to streaming services, which pay the least, let’s streaming our music on services that pay musicians fairly. Maybe we can reverse the trend toward lower and lower profits, if we insist on fair payment for our life’s work. For example, 10,000 streams on Spotify will net you $70. 10,000 streams on Rhapsody at .69 cents per stream will net you $6,900, significantly better. If you agree, comment at #fairpay4music. Please share, comment and tweet your thoughts. Follow this blog for more information in the coming weeks. Let’s make a difference.